Can athletic safety Eric Weddle draw on his history of success against Peyton Manning and pull off another upset for the Chargers? While the Broncos have lost to every one of the remaining AFC playoff teams, the Chargers may be the last team Denver would have liked to face in this coming round. In two games, the collective score between the two teams was nearly dead even (Broncos 48, Chargers 47), and the Chargers held the Broncos to both their two lowest yardage and point totals of the year. Add to all this, of course, the biggest feather in the San Diego’s cap as they come swaggering into Mile High: they beat Denver, in Denver, just one month prior. In that game, the Chargers rushed for 177 yards and held the ball for nearly 39 minutes. 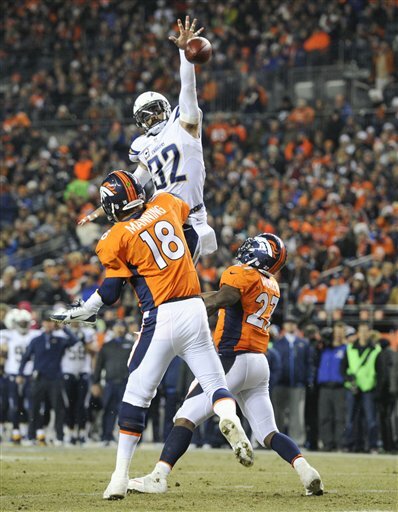 Defensively, the Chargers held the Denver to just 18 yards on the ground. Knowing all this, you can be sure that the Chargers will have no shortage of confidence as the come in as the underdogs in this contest. The win in Denver sparked something within the Chargers, who have led the league in rushing yards per game in the three contests they’ve played since, despite ranking only 13th on the year as a whole. If they can maintain their torrid pace on the ground, they might have enough firepower to both keep Denver’s offense off the field and keep up with it in a track meet if the need arises, seeing as their passing game (led by Philip Rivers, who finished this season with a career best 105.5 passer rating) is ranked fourth in the league. The Bronco’s defense has not statistically been very strong this season, giving up nearly 25 PPG and over 250 YPG through the air. The Broncos will also be without Von Miller, their premiere pass rusher – if Rivers can take advantage of a slowed-down pass rush and use the pass to set up the run (and potentially vice versa), the Chargers’ chances increase significantly. On the other side of the ball, there’s really nothing I can say that the numbers already haven’t. This Denver offense, is, statistically speaking, the most prolific the league has ever seen. While their scoring pace has slowed somewhat over the second half of the season (they’ve averaged 31.9 PPG as opposed to 43.9 PPG in the first half), they still weild enough offensive firepower to blow the doors off of most defenses. Both Eric Decker and Demaryius Thomas had over 1,200 yards and 11+ TDs through the air, and Wes Welker remains one of the most dangerous slot options in the league – not to mention the fact that Julius Thomas has emerged as one of the more productive threats at the tight end position we have seen in a while. This team can keep up with anybody. Peyton Manning had fits during the Broncos’ last matchup against the Chargers, playing against Pro Bowl safety Eric Weddle, who played mind games with the MVP quarterback before the snap, moving around and not allowing Manning to get a bead on whether he was blitzing, run-stopping or in coverage, and if the latter, where in coverage he would be. This forced Manning to pay more attention to him than he would have normally, distracting him from other components of the defense, such as hidden pass-rushers coming off the edge or outside linebackers dropping into coverage unexpectedly. Subsequently, we saw the Broncos’ offense at its least efficient all season. While there are many signs pointing towards a potential Chargers upset, I just don’t see it happening a second year in a row at Mile High. Peyton Manning is just too locked in right now to allow the Broncos to be eliminated in their first playoff game for the second year in a row. The Chargers will most certainly put up a valiant effort, but in the end, I like the 2013 MVP to lead his Broncos to the AFC Title game.